Our NYC Pain Management office is located between 5th and 6th Avenue on West 44th Street. Get on NJ-17 S from Essex Rd and W Century Rd. Continue on NJ-17 S. Take I-80 E, I-95 S and NJ-495 E to Dyer Ave in Manhattan, New York. Take the exit toward 42 St/Interstate 495 E/All Points/NY-9A from NY-495 E.
Walk 0.2 miles(4 minutes) North-East to NYC Pain Management office. Start from West 43rd Street, Turn left towards 6th Avenue, Turn right towards West 44th Street. Walk 0.4 miles(7 minutes) East to NYC Pain Management office. Start from East 42nd Street, Turn right towards 5th Avenue, Turn left towards West 44th Street. 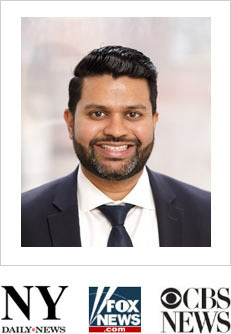 Dr. Febin Melepura is an Ivy League trained sport injury doctor and best rated pain management specialist in NYC who is highly specialized in treating any pain related issues – from neck and back pain to sports related injuries. Our pain management clinic in NYC works with most insurances and utilizes patients’ out-of-network benefits.